Wicked tune dis! If you want to spin a tune that will rock any dancehall or bedroom (or wherever you're playing it), this is it. Pampidoo has been a major Dancehall DJ for many years, with a huge record on the Freedom Sounds label. We haven't heard a firey tune like this from him in many years, so we're VERY PROUD to have him do a KILLER vocal on the same riddim as "Let There Be Love" by Johnny Osbourne. 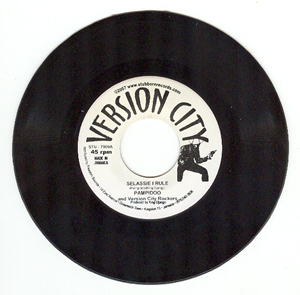 This is one of the coolest tunes we've ever had the pleasure of putting on our Version City label, and it's pressed IN JAMIACA for a truly authentic reggae record. It's deep roots with a rough, raggamuffin style vocal over it. Jah!